In Star Trek Online, aspiring captains can take the helm of one of more than 400 different ships that can be further personalized with custom color schemes, materials, shields, and capabilities. And now thanks to Eucl3D, a 3D printing company, those ships can be brought into the real world. If you’ve spent countless hours, weeks, even years, playing Star Trek Online, it only makes sense that you’d find yourself feeling a certain attachment to the ship you’ve commanded all that time. 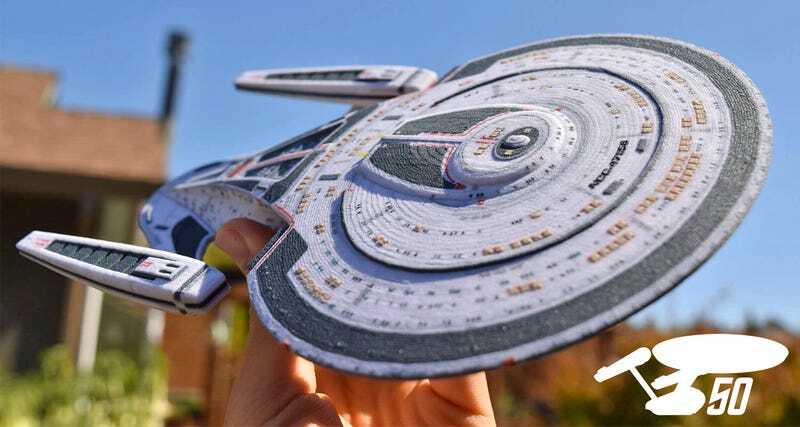 Pricing hasn’t been confirmed for the new service, but using full-color 3D printers—the closest thing we have to Star Trek’s replicators—Eucl3D will turn it into a 12-inch replica you can proudly display on your desk. Or, more likely, fly around your office while making warp engine sound effects. You’ll have to look real close at these models to see the telltale signs of 3D printing: those subtle lines created during the additive layering process. But otherwise there appears to be a tremendous amount of detailing reproduced, and each ship includes a display stand. There’s no word on availability yet, or if you have to be a registered Star Trek Online player to order one. But hopefully anyone can visit the Eucl3D site and create the Starfleet ship they’ve been envisioning since they were a little kid.